Adobe has been one of the favorite picks of the Hackers to mess with any systems devoid of any operating systems, as Flash Player is a front runner in all the browsers. Hackers have already been targeting Flash Player for long by exploiting known vulnerabilities roaming in the wild. Despite Adobe's efforts, Flash is not safe anymore for Internet security, as one more critical vulnerability had been discovered in the Flash Player that could crash the affected system and potentially allow an attacker to take control of the system. 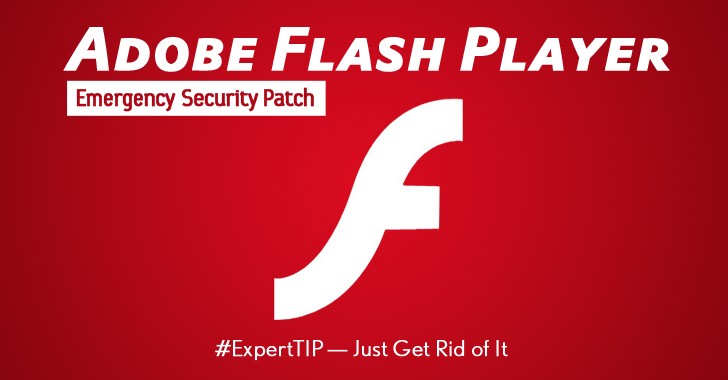 Discovered by a French Researcher Kafeine, FireEye's Genwei Jiang, and Google's Clement Lecigne, the flaw affects Adobe Flash Player 21.0.0.197 and its earlier versions for Windows, Macintosh, Linux and Chrome OS. The vulnerability, assigned under CVE-2016-1019, also expands back to Windows 7 and even towards Windows XP. Adobe had also confirmed that the newly discovered vulnerability in its Flash Player is being exploited actively in the wild. This issue caused the Adobe engineers to urgently work on a mitigation method and release an emergency update under Flash Player 21.0.0.182, which is expected to get released this Thursday. Usually, Adobe releases its patch on the second Tuesday of the month, the same day as Microsoft, but rolls out emergency patches on an ad hoc basis, analyzing the seriousness of the bug. The endless Adobe updates and upgrades had failed to ensure the user security in the real time scenario. So it's high time for users to disable or completely uninstall Adobe Flash Player. Believe or not, Adobe Flash Player is dead and its time has passed. In January last year, YouTube moved away from Flash for delivering videos. Although in between Flash made an effort to beef up its security in a bid to justify its existence, things got a bit heated when Firefox became aware of a critical bug and blocked the Flash plugin entirely. Facebook’s Security Chief publicly called for Adobe to announce a kill date for Flash. In fact, Google Chrome has also begun blocking auto-playing Flash ads by default.